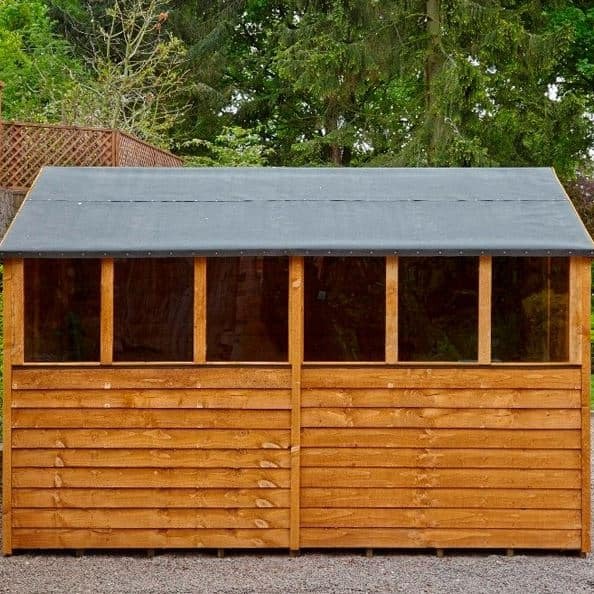 The Hartwood 10′ x 6′ FSC Double Door Overlap Apex Shed is one very interesting looking structure that is going to stand out very well in your garden. 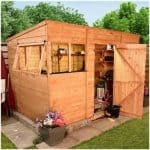 With most of its size being in its depth this is a shed that while offering you plenty of storage space, due to the width being 6 feet, even smaller gardens may be able to handle this shed. Two large double doors that are secured with solid hinges as well as ‘z’ braces on the back of them make storing and accessing your items very easy. One side of the shed has a vast amount of windows which are made with shatterproof styrene and are going to allow plenty of natural light into the shed. What gives this shed its rustic charm is the overlap cladding which has been used. Not only is this cladding very unique in its design, it is also very strong, due to it being an impressive 8 mm thick. 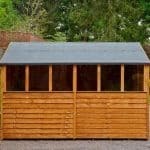 A very robust frame is attached to the cladding and this pairing makes for one very long lasting and well made shed. The apex roof has been designed to keep the rain from sitting on the top and from running down the front of the shed, this is a great design feature and in general the roof and the cladding is going to prevent any rain getting to your items. 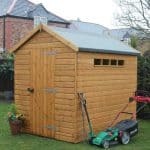 The Hartwood 10′ x 6′ FSC Double Door Overlap Apex Shed is one very interesting looking shed that while offering an incredible 10 feet 2 inches of depth, is made all the more adaptable to most gardens thanks to the 6 feet of width. The shed at a glance does resemble an old timey train car and that is something we just love about it as it gives it a very unique kind of personality. 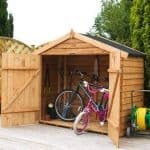 We love the storage space that this shed is offering and the fact that the width is a little bit more on the compact size, makes this a shed that is not just for the football pitch sized gardens. Walking in the shed is going to be quite the experience as the ridge is 7 feet in height. This means that when you are walking in the shed you will not have to be bent over the whole time. The apex roof slopes down towards the sides of the shed which is something that we always like to see as it keeps the rain away from the door as best as possible. The roof due to its immense size may be a little tricky when it comes to the installation, but the end result is well worth it. Considering the size of the roof they have still used very reasonably thick solid sheet boarding and a covering of lovely looking sand felt. We jokingly said that the shed had an old timey train cart look to it before and the reason for this is because they have used this very classic and rustic looking overlap cladding. This is some very strong cladding and at 8 mm thick it is certainly very robust also. The cladding due to the overlap design will keep the rain out and make sure nothing you have inside gets ruined. With this being a shed that is so long the framing has to be particularly solid and well made in order for the shed to stay strong and not feel flimsy. We feel that the 28 mm x 28 mm framing that is inside the shed will be more than strong enough to make this a structure that lasts well over 20 years. The pictures of the inside of the shed show that right in the middle of the shed there is some extra framing on the roof to give the shed that little bit extra strength. While in an ideal world all sheds would come with tongue and groove flooring, we know that the cost of putting flooring like that in a shed would see the price get close to or over £1000. So we are actually very happy that they have gone for solid sheet boarding which is more than strong enough in its own right and will be able to handle even your heaviest items like your power tools, lawn mower and even that weight lifting equipment you have which hasn’t seen any action since 1998. While we would have loved for this shed to be pressure treated, we can totally understand why they decided against this. As it is, the Hartwood 10′ x 6′ FSC Double Door Overlap Apex Shed will be given a basecoat treatment which will look after the timber while it is delivered, installed and even the first week or two of the shed life. You will though, need to coat the shed with wood treatment shortly after installation and then once a year after this. Once you do treat the shed then the 10 year anti rot guarantee will be validated. This to new shed owners may sound a little harsh, but this is actually the norm with most sheds these days. On the front of the shed are these two very well made double doors. Each door is supported with two heavy duty hinges and on the back of the door if you look real closely, you can see that there is a ‘z’ brace to make the doors extra strong. With these being double doors, getting your lawn mower or other larger items into and out of the shed is going to be no trouble at all. Having six windows along one side of the structure means that natural light is going to be able to flood inside this shed. The windows are made with 1.2 mm thick styrene glazing which is shatterproof. We are fine with the material used for the windows, but we do feel that they could have made at least one of them be a window that can actually open. In general this is one very solid shed and the door does keep firmly closed with the included hasp and staple. 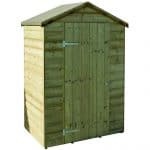 We do wish that they had thrown in a padlock with this shed, but you can easily purchase one of these from a pound shop. If you want a locking mechanism that is a little more high quality then they do offer a Yale Hasp Steel Black Finish 120 mm & Brass 40 mm Padlock. This is a little on the pricy side for a padlock, but it does go very well with the design of the shed. Well as there are six windows along one side of the shed, you really are not going to be getting a whole lot of privacy with this shed. Of course you could always use some blinds, curtains or just a piece of fabric to cover the windows if you do want to hide your items a little bit. This is a shed that has a really unique look to it and while we do love the style it already has, you can have some fun by giving it a coating of coloured wood treatment. Wood treatment can be purchased in some very interesting colours these days so be sure to have a look around and consider some of the more wild colours. As well as the hasp and padlock set, you can also purchase plastic shed base. 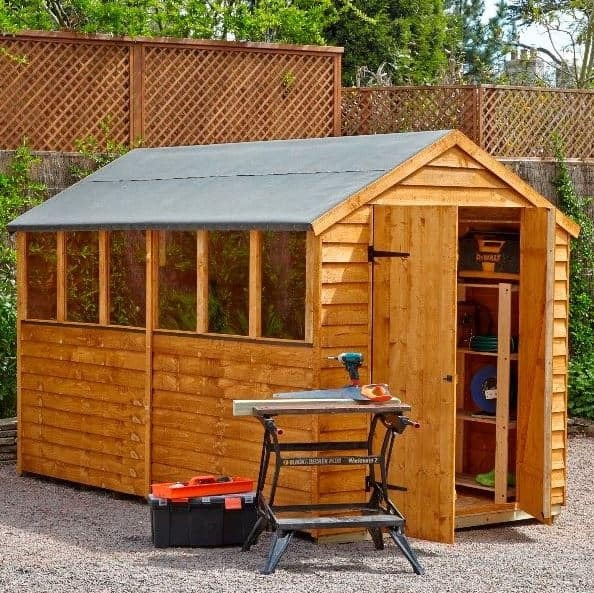 This is aimed at those of you building the shed on grass, but to be honest it is not something that is essential, and at £165 it is a very expensive extra. We will admit that with the shed being the size that it is, we thought they might have to cut a few corners here and there, but actually they have somehow managed to make this one very high quality shed and not raise the price considerably. The selection of materials used in this shed was very clever as they will last for many years and apart from the annual treatment, do not really require a whole lot of looking after. We know that this may seem a high rating considering the width is only 6 feet, but that 10 feet of depth more than makes up for it and will allow you to store many things inside this shed. Any shed that is 10 feet is going to be a rather awkward to install. You will need another person to help you install this and possibly up to 8 hours to get it done and then a further 2 hours to relax, cry and get over the installation process. 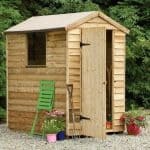 At £400, this is a shed which we feel is very fairly and competitively priced. 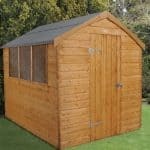 The size and overall quality makes this a shed which we are sure you will be very impressed with. Final Thoughts: The Hartwood 10' x 6' FSC Double Door Overlap Apex Shed at a glance really does grab your attention. It has a very interesting look and the pictures make this seem far larger than it actually is. 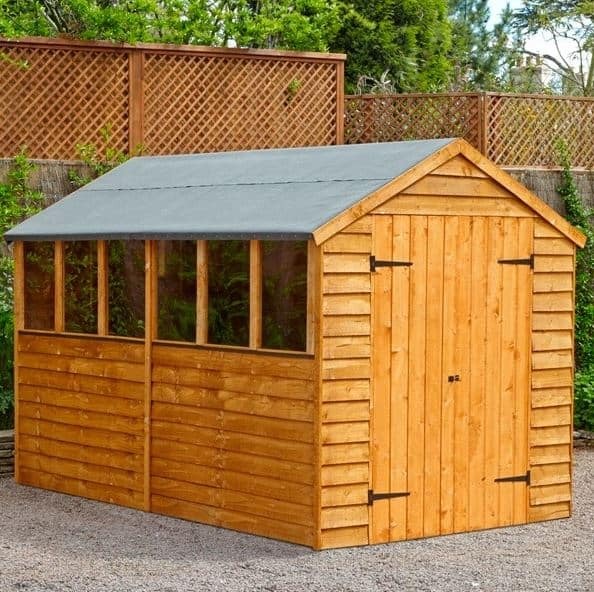 Do not get us wrong, 10 feet of depth is not small at all, but with its width being so compact do not right away feel that this is a shed that is too large for your garden before you go outside and take some measurements. We are sure this shed will actually fit in far more gardens than people would think. 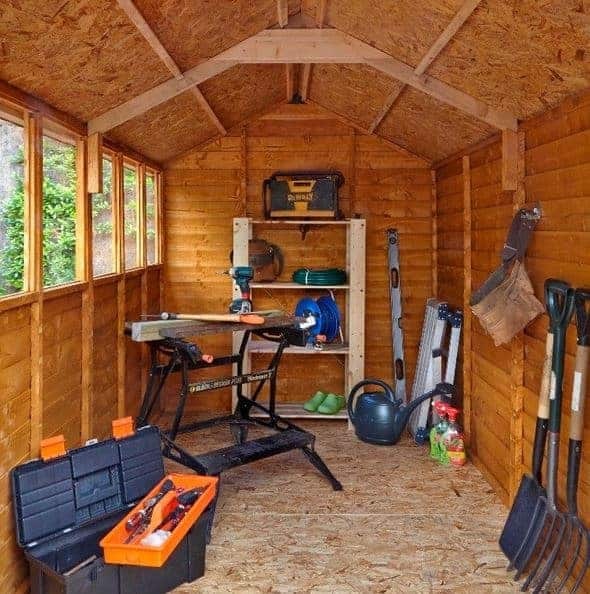 We really like this shed and feel that it is one of the more underrated sheds that is out there right now so before you see that 10 feet in the title and dismiss it, have a good look at your garden and see if you can fit this in as we are sure you will not be disappointed if you can.